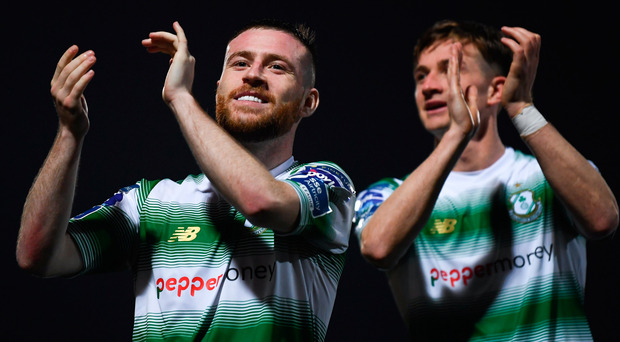 The threat from one rival impressively swatted away, Shamrock Rovers will know over the course of the next week if two other challengers can put up a fight and prevent the 2019 title race from becoming a procession for the Hoops. Daniel Kelly had a very Good Friday by helping himself to a hat-trick as Dundalk swept Finn Harps away. Bohemians moved to second in the table thanks to a win over Sligo Rovers that featured two goals and two red cards on a lively night at the Showgrounds. David Parkhouse struck gold for Derry City against 10-man Finn Harps in a fiery north-west derby. The decisive blow might have been self inflicted, but Dundalk can have no complaints about the loss of their unbeaten record. Stephen Bradley has had to wait for his first win at Turner's Cross, but it was worth the wait. In a repeat of last year's FAI Cup quarter-final, UCD outplayed Waterford once again to run out emphatic winners at the UCD Bowl. In a repeat of last year’s FAI Cup quarter-final, UCD outplayed Waterford once again to run out emphatic winners at the UCD Bowl. Stephen Bradley has had to wait for his first win at Turner’s Cross, but it was worth the wait. Cork City boss John Caulfield has suggested that Shamrock Rovers have arrived at Turner's Cross in recent seasons with a plan to contain the Leesiders. That early-season promise from St Patrick's Athletic looks like a distant memory as the Saints slid into the bottom four after yet another goal-free evening. For five straight seasons, the meetings between these sides have defined the tale of the League of Ireland title race.